Robert F. Breiman, MD, will be director of the Emory Global Health Institute effective April 2013. The Emory Global Health Institute (EGHI) has named Robert F. Breiman, MD, as director, effective April 2013. 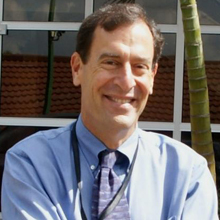 Breiman is currently country director for Kenya for the Centers for Disease Control and Prevention (CDC) and head of the Global Disease Detection Division for CDC-Kenya. Breiman also will hold faculty appointments in the Hubert Department of Global Health in Emory's Rollins School of Public Health and in the Division of Infectious Diseases, Department of Medicine, in Emory University School of Medicine. Jeffrey P. Koplan, MD, MPH, founding director of the Emory Global Health Institute, will continue as vice president for global health at Emory University. "My team and I are delighted that Rob Breiman will be joining us as director of the Emory Global Health Institute. He will bring expertise in global health research and leadership as well as new perspectives and potential partnerships," says Koplan. "I look forward to working with him to help broaden Emory's global health reach around the world." In his current positions Breiman oversees more than $200 million dollars a year in U.S. government funding and $20 million per year in non-CDC research funding. The CDC employs approximately 35 U.S. citizens in Kenya and more than 100 Kenyans, and provides technical leadership for 1,500 Kenyans in a research and intervention partnership between the Kenya Medical Research Institute and CDC. Breiman also directed surveillance for infectious diseases, outbreak investigations, preparedness, and research, and builds collaborations with local ministries of health and with academic institutions worldwide. "In recent years, Emory has assembled a diverse group of highly skilled scientists from a variety of disciplines, bringing them together to innovatively and substantively contribute to multi-faceted advancements in global health," says Breiman. "This provides a plethora of possibilities for new directions and progress in the near future. I think that the best is yet ahead for Emory as a leading academic institution for global health, and I am thrilled to be joining Emory's dynamic and highly collaborative environment." The Emory Global Health Institute (EGHI) was established in 2006 as a university-wide strategic initiative to support Emory faculty, staff, students and alumni in their work to find solutions to critical global health problems. The EGHI builds on Emory's long history of highly successful global health projects and partnerships by supporting innovative research studies and programs, training programs for students and health professionals, partnerships with governments and academic and private institutions, and scholarship and information sharing through symposia, speakers' series and curriculum development. "The Emory Global Health Institute is to be congratulated on its extraordinary record of accomplishment over the past six years, and I am proud to welcome Rob Breiman as a key new member of its leadership team," says James Wagner, president of Emory University. "Leadership in global health has been a significant component of Emory's strategic plan, and the Emory Global Health Institute will continue to help Emory contribute substantively to our vision for effecting positive transformation in the world." The EGHI includes a number of educational and outreach initiatives, including the Emory Global Health Institute Field Scholars Awards Program. Each year, students from across Emory University receive these awards to conduct innovative global learning projects that involve a partnership with local country organizations. The EGHI also coordinates a Global Health Student Photography Contest for students across the University. An annual Global Health Scholars Symposium and photography contest awards ceremony celebrate the accomplishments of these students. The Emory Global Health Case Competition annually brings undergraduate and graduate students from around the United States and other countries to Atlanta to participate in an intensive and increasingly popular multidisciplinary educational challenge. Through funding from the Bill and Melinda Gates Foundation, the EGHI has been instrumental in developing two highly successful global initiatives -- the Emory Global Health Institute-China Tobacco Control Partnership and the International Association of National Public Health Institutes (IANPHI). Before joining the CDC, Breiman directed infectious diseases and vaccine programs at the Centre for Health and Population Research in Bangladesh. He was director of the United States National Vaccine Program Office and was chief of the Respiratory Diseases Epidemiology Section at the CDC's National Center for Infectious Diseases. Breiman received his medical degree at the University of Arizona in 1979 and was chief resident at the UCLA San Fernando Valley Medical Program and a Fellow in Infectious Diseases at the UCLA Center for Health Sciences. He was a member of the CDC's Epidemic Intelligence Service. He is Board Certified in Internal Medicine and Infectious Diseases. Breiman serves on numerous global committees related to infectious diseases and vaccines. He was recently installed as the Chair of WHO's Immunizations and Vaccines Implementation Research Advisory Committee. He is principal investigator of studies on pediatric diarrheal disease, infant pneumococcal and other respiratory diseases, and on typhoid prevention. Additionally, he has been principal or co-investigator on vaccine studies related to pneumococcal disease, influenza, rotavirus and cholera. Breiman is author or co-author of more than 260 journal publications and chapters. Koplan will continue to be actively engaged in all aspects of the EGHI. He and Breiman will work closely together to advance the EGHI goals of creating a robust global health infrastructure at Emory, fostering Emory's global partnerships and multidisciplinary scholarship opportunities, and promoting Emory's reputation as an international leader in global health.